This blog is all about things that entertain me. One of the things that entertains me right now is digging through my old books and papers that I wrote years ago, and putting them up on the internet. Here’s one that I found this afternoon (May 20). This is another essay from the vaults, something I wrote 36 years ago, and then just put away. I found it in an envelope which contains pages and pages of random sci-fi environment creating rules for use with my Starfaring game. I may post some of that here, too. I don’t know why I wrote this–certainly there is nothing at all revolutionary or original in my contention that the galaxy is full of all kinds of alien life and intelligence. Still, it shows where my head was at back in 1976. To some degree, my head is still in the same optimistic place. While writers like Von Daniken and Temple have been thoroughly disproved by later, more skeptical analysis, one should remember that they presented their own theories. Imaginative people form wild theories from the evidence they see. Wild theories are usually, but not always, wrong. People like to simplify things, but the truth is, things are more complicated than they seem. And I like to be hopeful about such things. The front cover for my second game design. 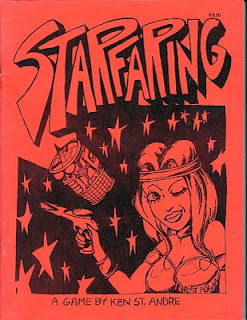 Starfaring was heavily influenced by Star Trek, but it contained most of my personal beliefs about alien life in the galaxy. The joy of science fiction is that one can ask what if? and then set the parameters for oneself. This explains how and why so many different interstellar wargames have sprung up in the last three years. Having just tried my own hand in thet particular area (Starfaring–Flying Buffalo–$6.00) I felt it might be interesting for both players and posibly other game designers if I could briefly go over some basic ideas that I would like to see hold true in astronomy. For several years there has been a lot of excitement in scientific circles about the possibilities of life elsewhere in the galaxy. Carl Sagan has been the leading scientific proponent of extra-terrestrial intelligent life, and Erich von Daniken has been the leading non-scientific supporter. Whether one believes in ancient astronauts or not, there is a good deal of evidence that the Earth has been visited by star-traveling races in the past. 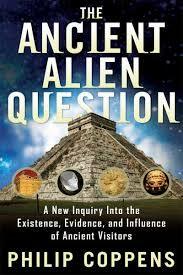 (See Robert Temple’s scholarly book THE SIRIUS MYSTERY.) And, though Project Ozma is a thing of the past, radio astronomers all over the world are still quietly listening for that first signal that will tell us we are not alone. 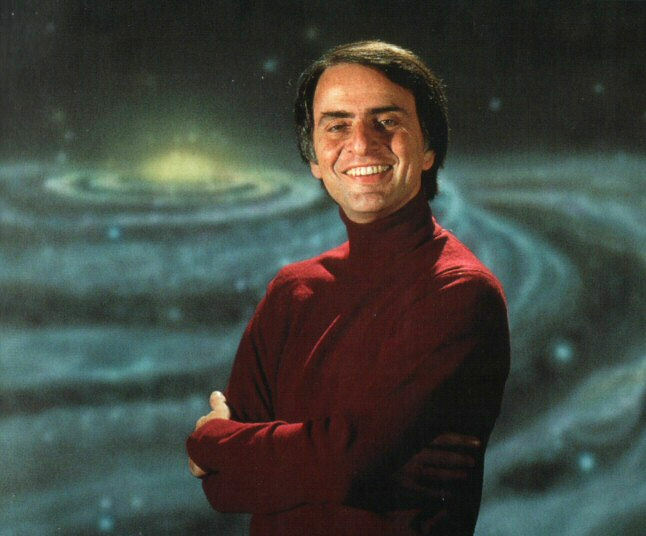 Sagan was famous for mixing hard science with sense of wonder imagination. However, everyone is much too pessimistic and narrow-minded about things just at present. Now that we know that stars and planets are formed by the same process of gravity condensation, it seems just too faint-hearted to assume that solar systems are galactic rarities. Nor does it seem entirely reasonable to limit them to Sol-type stars. From blue giants to red dwarves, all stars should be expected to be companioned by planetary systems. Though about half the stars in our galaxy are multiple star systems–binaries, trinaries, and perhaps even more, even they should not be absolutely ruled out as settings for solar systems. After all, Pioneer X, on its pass by Jupiter, proved that what we thought was a very large planet may actually be a very small, cool sun. Then there is the matter of a sun’s habitable zone. Regardless of size and temperature, there will be some orbital distance where a planet of the right size could maintain an atmosphere suitable for the evolution of life–that is, life as we know it, carbon-based, DNA-RNA replicating molecules. Nor should we exclude the possibility of life based on a different element or combination of elements. Silicon, methane, chlorine, all are possible life bases. I don’t think I’m being very original in proposing a law of organic optimism. “If life can arise, it will.” Some of the latest studies of Titan, the largest moon of Saturn, suggest that organic life may be in its earliest stages of evolution there. Certainly, plenty of organic molecules have been detected from space, even up to ethyl alcohol in free-floating clouds. So that leaves us with a universe teeming with planets and crawling with life. What about intelligence? It abounds. On Earth alone we are now learning that Man has been sharing the planet with several other intelligent life forms–not very graciously–since the beginning. Bees, ants, termites, etc. show every evidence of hive mentalities maintaining stable cultures indefinitely, with elaborate architecture, social customs, and specialization of labor. Dolphins and whales of all species have larger and more convoluted brains than we do. They have given evidence of being able to learn our speech, and of having a distinct language of their own. Chimpanzees and gorillas have been taught a human-designed sign language that allows and facilitates simple conversations between men and apes. The grizzly bear has been seen to have even more problem-solving ability than do apes. I could go on with examples for quite a while. But despite our burgeoning knowledge of animal intelligence, we haven’t really succeeded in communicating effectively with any of the other intelligent life forms here on our own planet. Man is set apart from other intelligence on this planet by his application of technology. For at least the past 12000 years, it has shaped us into what we are today. Give a culture of grizzly bears or raccoons adequate food, planetary dominance, and 12000 years to mess with technology, and you’d be surprised at what develops. With so many different kinds and levels of intelligence here on one planet, just imagine how much there must be o ut there in the stars. A lot of it is going to be so alien we may never recognize it, may never be able to communicate with it, but some of it is going to be shaped by the law which states that similar caouse produce similar effects into alien races that we can relate to. So, that is why the table on page 51 of Starfaring is havily weighted in favor of life, even of intelligent life. Logic demands that the universe be aswarm with every imaginable (and some that aren’t) form of life, and the sooner we get out to the stars, the sooner we’ll meet them. The point is: Designers of interstellar games are going to have to incorporate a lot of sheer alien strangeness in, if they hope to have any realism. P.S. With the Viking lander sitting on Mars testing for micro-organisms, with more and more evidence coming to light from both science and mythology that Earth has been visited–possibly seeded–by alien intelligences, with never-ending u.f.o. reports steadily accumulating, it is unreasonable to assume human pre-eminence in the galaxy–either now or in the future. Star traveling races may be rare, but you can count on them being a lot more common than either Carl Sagan or The Good Doctor (i.e. Asimov) would admit. I regret that the tone of this article has been so wild and exuberant, but every statement I have made can be backed up by articles or programs in the everyday media of books and television. I should have footnoted all my claims, but I didn’t make a list of bibliographic entries as I was picking up this information piece by piece. I throw myself on the mercy and general informedness of all those likely to see this piece to compensate for my lack of rigor in presentation. If you’re a fan of alien life, or if you’ve actually met aliens, please leave a comment.